Sigma’s DC 18–250mm f/3.5–5.6 Macro OS HSM lens is designed to be an all-in-one lens and the focal length is one of the widest available on the market. It was specifically designed for use with an APS-sized sensor, which makes it more like a 24–300 lens, depending on the crop factor of the camera model. On the Canon 650D the lens becomes a 28–400mm zoom. Unfortunately, physics come into play with lenses and as you extend the zoom range, there are sacrifices that must be made to be able to cover such a wide zoom. The corners of the image are soft throughout the zoom range, particularly at the far ends of the aperture spectrum (f/22, f/5.6) and the blurred corners are more noticeable at the wider zoom settings — images are sharpest between f/11 and f/8 setting. There is also fairly significant chromatic aberration in high contrast images, which is to be expected when there are so many pieces of glass involved. 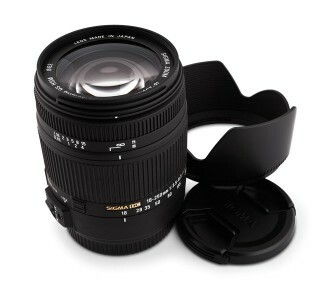 But at f/11 the images are sharp and of good quality and when you are travelling in a location where you don’t have time to swap lenses, or physically can’t, then this lens is a good option. The autofocus is pretty good and the minimum focal distance is 0.35m, which is why Sigma claims that it can focus down to ‘Macro’ (comparatively, a Canon 70–200mm L-series lens’s minimum focal distance is 1.2m). The lens did struggle to quickly focus when starting with something close up, zoomed out and then zooming in to try and focus on something in the distance. This lens also has image stabilization that works as intended, but it does slow down the autofocus a bit. There are a few other features of the Sigma 18–250mm lens that are useful, like having the manual focus ring locked out when autofocus is turned on. This means you can’t accidentally move the focus ring when zooming in or out and there is also a lock on the zoom so that when you are walking around the lens stays compact. Overall the Sigma 18–250mm lens is a good option if you are travelling and have to go really light and don’t want to carry an extra lens or are in a situation where you can’t swap lenses and need a wide range of focal lengths. Unfortunately it only works with small sensors, so anyone shooting on a full frame can’t use this lens.